용뉴형(龍鈕形) 옥보(玉寶)인 는 대한제국 선포 때 제작한 고종황제의 국새 10과 중 1과로 황제가 직접 관료를 임명할 때 내려주는 임명장과 훈장서훈 사유를 적은 훈기(勳記)에 찍는 인장이다. 는 조선이 자주국가인 대한제국이며, 고종은 황제임을 선포하고 이후의 모든 국가 행정문서와 궁중의례에 사용하기 위해 제작한 어보 중의 하나이자 국새로서 역사적 가치가 있다는 점, 왕실 공예품으로서의 공예사적 가치가 있는 점, 국외 반출되었다가 60년 만에 환수된 의미 있는 유물로 보존 상태도 양호하다는 점 등 지정 가치가 있다. 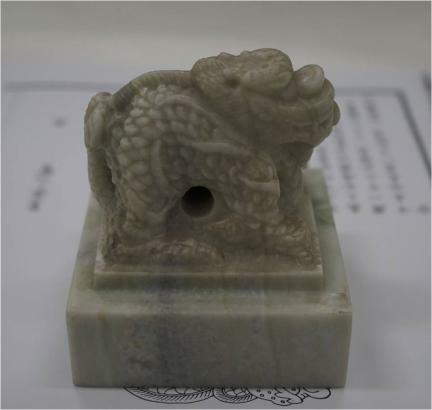 This dragon-knobbed jade seal bearing the inscription of four Chinese characters, Hwang-Je-Ji-Bo (literally meaning "Seal of the Emperor"), is one of the ten imperial seals made upon the foundation of the Korean empire in 1897. 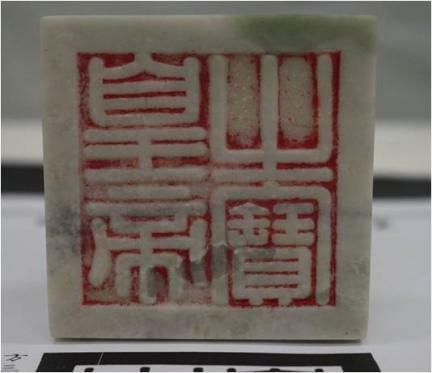 The seal was used by Emperor Gojong (r. 1897-1907) to sign various documents related with state affairs, including the appointment of officials and the presentation of awards and decorations, as well as the ceremonies of the imperial family. The seal is generally regarded as worthy of inclusion on the national cultural heritage list and protection by law in view of its significant historical value as a symbol of the independence of the Korean Empire, its artistic excellence as a representative item of Korea's royal handicraft heritage, and its good state of preservation. As well, it is worth being designated as a treasure in that it was returned sixty years after having been taken out of the country.